​Coke or Pepsi? Mac or PC? Republican or Democrat? We know the world is filled with infinite shades of color, but we work hard to reduce it to dichotomies. Black and white is easier than the complexities of grey. Perhaps this attractiveness of the simple is the reason that Mexican cinema has recently presented us with two black and white visions of Mexico City in the form of the films Güeros (2014) and Roma (2018). Instead of the simplicity, however, that colorless films might suggest, Güeros and Roma are movies that embrace the ambiguous. Indeed, it is possible to argue that the image they present of Mexico City is multi-layered and contradictory to such a degree that they are impossible to reduce to succinct description. This invitation to manifold interpretations is frustrating for some. With this in mind, after seeing Güeros, I asked an advanced course on Latin American culture this year how they felt about watching a movie that challenged and pushed them to reach an interpretation that might be impossible. The conversation that ensued illustrated a point: Artistic films like these are understood in personal ways. The complexities and depth of the movies provided space for students to each develop their own interpretations. Their ideas were very different, even flatly opposed at times. In the end, I suppose, their readings of the films reflected more who they were and their cultural baggage rather than the films. In other words, instead of changing forever our comprehension of the movies, the deepest and most valuable insights were personal. This embrace of the ambiguous is important. Human nature seeks simplification. We prefer life to be clean and neatly organized. Yet the world pushes back, knocking things out of well-defined categories or presenting something that does not fit in any of our pre-established boxes. I used to laugh at the story of Barnes and Noble versus the Bible. Where should they put the Bible in the store? Which section is appropriate? If they put it non-fiction, they will offend some people. Fitting it on a shelf in fiction would satisfy some, but anger others. In the end, they spread it about the story. There is a copy in fiction, non-fiction, even self-help! This anecdote is humorous, but it also illustrates the point: Even as we seek to reduce the world into simplified categories, it resists. ​With this in mind, I encourage you to see Güeros and Roma. They are films that at once are excellent and merit criticism. It is possible to say that they are artistic. This is true insofar as art should help us see the world for what it is and thanks to movies like Güeros and Roma’s use of black and white, we can better explore the infinite tones and layers of grey in our multifaceted and contradictory world. A couple of years ago I read a biography of Walter Benjamin. It told the story of him being pursued by the Nazi’s growing influence on Europe. First he left Germany as Hitler came to power. He went to Spain where things were okay for a short period, only to witness the country also turn Fascist. So it was off to France, first Nice and eventually Paris. In the end, with Germany invading France, both Fascism and death surrounded him on the Franco-Spanish border where, today, you can visit his grave in the Catalonia town of Portbou. The biography relied heavily on letters that Benjamin wrote during this increasingly desperate period. Something that jumped out to me was the frequency with which he mentioned belongings. There were multiple times he listed his meager possessions. These lists also included laments about needing something -a book, a tool, an article of clothing- that he had left behind in one place or another. This made me reflect on an important question: What would you bring? If you suddenly had to leave your life. If unexpectedly the political winds shifted in such a way that your family was in danger, what possessions would you pack into the bag or two that you could carry? The question is difficult, but I think it is valuable because it has the potential to humanize the experience of exile and immigration. While the foreignness of a country and culture we do not know might make it difficult to imagine the life of a Central American who feels the need to flee, it is possible to reflect on our own lives and what it would mean to leave. At least this is what I hope. We need to think about these situations in as human a way as possible. The news this week brings us more than one tragedy and it is important not to ignore what is happening. The Trump administration has been separating immigrant children from their families. This in itself is tragic. However, the Immigration and Customs Enforcement agency decided to take advantage of this by using these children as bait. 170 immigrants were arrested by ICE when they volunteered to take care of the children held by the government. In other words, the government separated children from their immigrant families and then used the kids to ensnare more immigrants. Of course, this also means that the children continue in government custody and now it is little likely that others will volunteer to help them. Here is an article that describes this heartbreaking scheme. The common theme here is children not being children, but being used by the US government as something else. In the first case, as bait to trap immigrants. In the second, as a warning to make others who might follow think twice. We need to think about our humanity. What would you bring if you had to leave your home? What would you pack in your bag? ​Soon after his death, I read Anthony Bourdain’s Kitchen Confidential. His television programs and a few of his articles had already given me a good idea as to who his public persona had become. The book filled in spaces and, taking the things together, I developed quite a bit of respect for him. A couple of years ago I was fortunate to eat at a José Andrés restaurant in Washington DC. The food was great and the experience of sharing it with family was even better. Lately, the extraordinary work that he has done helping feed people in disaster areas has pushed his name onto the nominations list for the Nobel Prize. Said simply, both Bourdain and Andrés are inspirational people. Remarkable people are often linked to impressive places. Andrés lived the first five years of his life in northern Spain in a region called Asturias. On a personal level, Asturias changed my life. It is a part of the country that surprises people whose vision of Spain is populated by Hemingway, bulls, and sangria. When I first arrived in the late nineties, my vision was even more limited. The rugged mountains, rainy climate, and Celtic culture broadened my conception of the country and the years that I spent there were, as I have written about elsewhere, key to becoming who I am today. Fortunate for us, Bourdain, Andrés, and Asturias recently came together in one of the last episodes of the food and travel show Parts Unknown. Andrés and his larger-than-life personality are host and guide as he introduces his homeland to Bourdain. Seemingly unsure at first, it feels genuine as the combination of enthusiastic guide and amazing place endear themselves to even an experienced traveler like Bourdain. Knowing that not long after this show was filmed, Bourdain would commit suicide adds poignancy to their experiences. I hope you enjoy. Perhaps it can be explained by the success of the film Coco. Or maybe it has something to do with the back and forth flow of public sentiment where one part of society criticizes a culture and, as a result, some other part embraces even more the criticism’s target. Irregardless of the reason, it is wonderful to see Boston’s first official celebration of Día de muertos. In the following article you can find details of what is happening. Also, worthy of mention is Harvard’s Peabody Museum which not only has activities scheduled for this weekend, but has an ongoing exhibition related to the celebration. Information is power. The way we count people, the words that we use to put them in groups, and the interpretations that we give to the data are all powerful forces. The cliche is that the powerful write history, but it could also be argued that they get to count the numbers, decide what they mean, and thus influence the future. Right now there is a debate about whether 2020’s US census should include a question about citizenship. The theory is that such a question could frighten a lot of people and push them to avoid participation. The results could be serious in many ways, not least an impact on elections or a reduction in the services that support some of the most vulnerable in our community. With the idea that data is power, I think sharing the following document is important. How many Latinos live in Boston? Where do they come from? Where do they live? What are their lives like? The following tries to answer these questions by profiling the seven largest Latino groups in the region: Puerto Ricans, Dominicans, Salvadorans, Colombians, Mexicans, Guatemalans, and Brazilians. Said simply, good data informs our lives and credit is due to the Boston Planning and Development Agency for providing this public research. Just a few days after Spain’s annual celebration of its connection to the international Spanish-speaking community, Mario Vargas Llosa published his thoughts about “hispanidad”. In general terms, he presents himself as a defender of both the word and the concept. While recognizing some of the prices that were paid for Spanish colonialism in the Americas, he points to the region’s cultural connections to the western tradition, all of the way back to classic Rome and Greece. He also mentions, more than once, the power and importance of the language. For some Spanish speakers, the word “hispanidad” evokes pride. For others, it is a reminder of a colonial past. This dichotomy feels simplified and false to me, but nevertheless it felt worthwhile to share this opinion piece. Not least because it was written by Vargas Llosa, but also because it was written well. It isn’t clear to me that the good mentioned by Vargas Llosa outweighs the costs, but I’m also not sure that this is the correct question to be asked. Spain’s colonial legacy in the Americas is one that all Spanish speakers must incorporate into our lives. To see it as simply a point of pride or a reason for anger is a way of avoiding the reality in its entirety. Whatever your feelings about “hispanidad,” reading Vargas Llosa’s writing can be fun. At the very least the experience reminded me of an observation made by a friend; one that once it was said to me I’ve never been able to unsee: Vargas Llosa is a great writer, no doubt. However, his books lack humor. It’s almost as if his words are proof that he’s a man who missed something beautiful in life. Ouch. Read it yourself to see if you agree. ​Last year I wrote some thoughts about the advantages and disadvantages of online learning. Suffice to say, I think the positive outweighs what is lost when taking a course via the internet. For this reason, I not only continue to teach online courses, but I’m trying to do it more often. Again, I don’t want to repeat what I wrote before, but it is wonderful how accessible online learning is for people who might otherwise have difficulty finding their way to a classroom. 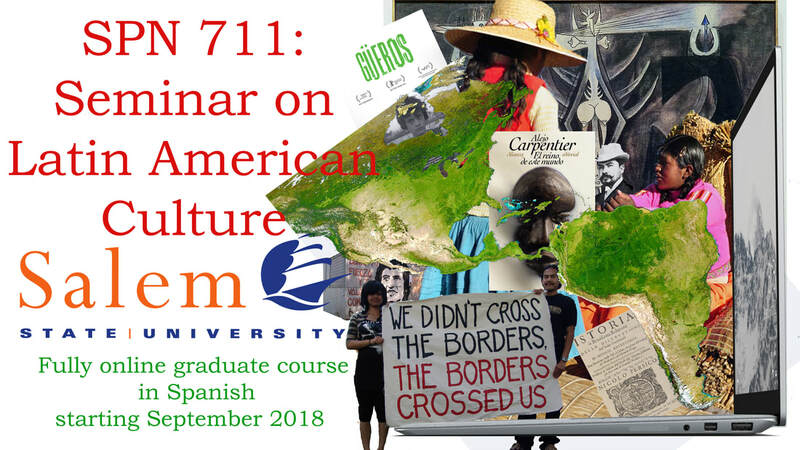 With this in mind, it is exciting to announce that this fall I’ll be teaching a graduate-level course on Latin American and US Latino culture. You can find all the details at this link. I’m looking forward to the experience.